Helios, Crusader and Land Raiders. Vindicators & Predators (both modified). Landing Craft (ForgeWorld proxy) & Thunderhawks. Strike Cruiser & Drop Pods. 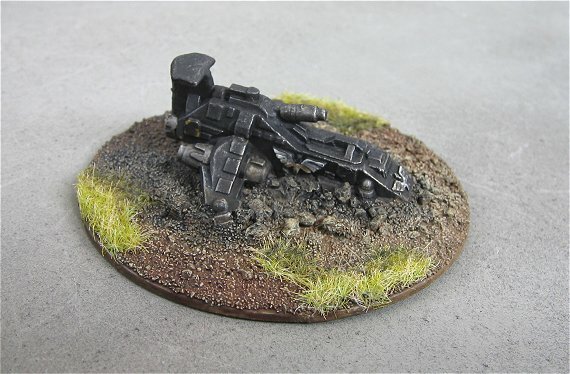 A crashed Thunderhawk as an objective. This is my Epic Black Templar army at the moment. The painting process on this lot is very simple. Spray with a matt black. Drybrush with Vallejo Light Grey. Use either Skull White or Bleached Bone for some detail. I’m actually in the middle of revamping some of these miniatures so the army will eventually look a little different. There are MANY more bits and pieces waiting to be finished and added to the force aswell. I’ll be adding more photos as I finish new units. This was an army I painted a while back for a mate. The Emperor’s Rams is a Chapter of his own design and he’d made a good start on painting them but eventually asked me to finish them off for him. Unfortunately I don’t have any pictures of the whole army. The photo above was the last batch of reinforcements to complete the force. I’ve asked my mate to send me any photos he has so there may be some additions here. 3 custom objectives I made for him. A wash with diluted Scorched Brown. Hatches, shoulder pads etc. painted with Shadow Grey. Boltgun Metal was used for all weapons. Lastly was a wash with Woodland Scenics Black pigment for detail. I painted these Dark Angels for my brother. Again, there will be more added over time so I’ll add photos as I get things painted. Drybrush with Goblin Green next. The emblems are painted in Skull White. The vehicle treads/weapons are painted with Boltgun Metal. Next is a wash using Woodland Scenics Black pigment. Vehicle treads are washed with Woodland Scenics Raw Umber.